There are a lot of lakes that people suspect may hold a world record bass. But there‘s one where you can be certain a record is waiting. That’s because a world record size bass was recently caught there – and released. 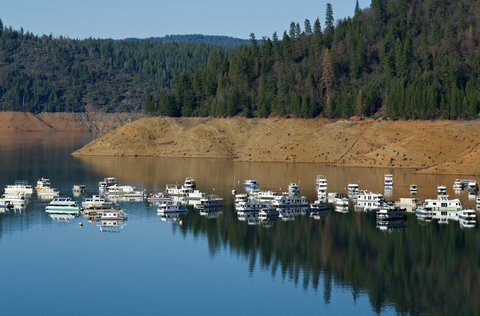 That would be California’s New Bullard’s Bar Reservoir, 78 miles north of Sacramento, where an 11-pound, 4-ounce spotted bass was caught on November 29th. Guide Paul Bailey, who caught the bruiser, chose to release it rather than kill the fish. The nearest certified scale (required for an official record) was 75 miles away. Bailey photographed the fish and weighed it on two different scales before letting it go, but lack of a certified scale means it will not go down as the world record – unless someone else catches it. Bailey caught the fish while filming an episode of Stoked on Fishing. At the time, Baily was discreet about the location, but the word got out and the photos make clear the location was Bullard’s Bar. Huge bass are not uncommon to the fishing grounds. The California Department of Fish and Wildlife certified a 10.38-pound spotted bass — caught in March 2015 by Tim Little — as the state record. The reservoir also kicked out an 11 pound, 3-ounce bass caught by angler Louis Ferrante on February 21, 2015. It is not certain why spotted bass grow to such large sizes in California reservoirs, but most authorities attribute it at least in part to plentiful food sources, particularly abundant “bite size” kokanee salmon (landlocked sockeye). Spotted Bass are native to the southern United States and were introduced into California’s large reservoirs. They are often confused with smallmouth bass, but lack the characteristic vertical bars found on the side of smallmouths. Of the several strains of spotted bass the largest –Alabama spotted bass — were introduced in California in 1974. There’s at least one world record spotted bass waiting to be caught in Bullards Bar Reservoir. If you go after it, make sure to bring a certified scale.